Cost:$5 donation for adults; kids and museum members FREE! Step back in time and tour the historic Crawford home. 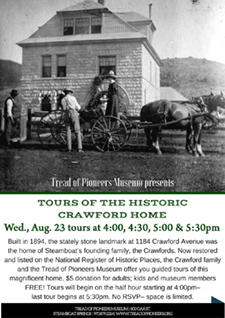 Built in 1894, the stately stone landmark at 1184 Crawford Avenue was the home of Steamboat�s founding family, the Crawfords. 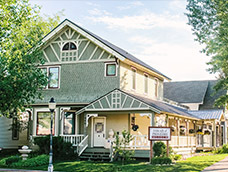 Now restored to its original condition and listed on the National Register of Historic Places, the Crawford family and the Tread of Pioneers Museum offer you guided tours of this magnificent home. last tour begins at 5:30pm. No RSVP� space is limited.